Partnering with the City of Edmonton, UAV North is proud to present another commercial real estate aerial video! 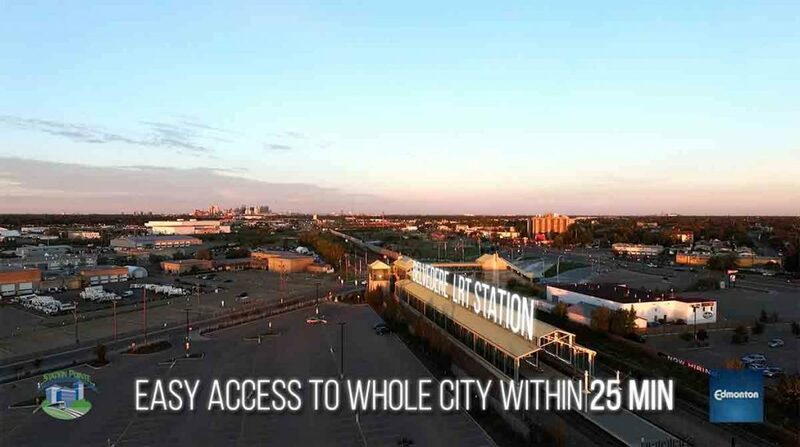 This video is of the Station Pointe project, located on Fort Road, just south of Belvedere LRT Station in the northeast corner of Edmonton. This video was shot with our drones, and filmed at sunrise to get that awesome colour. One of our favourite scenes is the rising shot from the LRT station with the downtown skyline in the background, all while being lit by the gorgeous morning light. The stack from the old Gainers meat packing plant is also pretty cool to see from an aerial perspective as well! The City as the Land Developer, has created the Station Pointe Project; a model for Transit Oriented Development. It is a demonstration project for Edmonton’s Urban Land Intensi cation Strategy/Smart Choices as part of Edmonton’s Urban Sustainability Action Plan and incorporates environmentally sustainable development practices. As the 2004 Award of Excellence winner from the Alberta Association, Canadian Institute of Planners 2008 Brownie Award of Excellence from the Canadian Urban Institute, as well as a being accepted as a nalist for the 2010 GLOBE Award of Excellence in Urban Sustainability, this project is a joint e ort by the City of Edmonton and the Fort Road community and a more a ordable alternative to urban sprawl. We hope you enjoyed this aerial production, and see the value that an aerial platform can provide to your project. If you have an aerial project that you’d like to discuss, please don’t hesitate to contact us or call Chris directly at 587-991-0997. We look forward to hearing from you!